I prepared the following side dish for our Chef Spotlight dinner where we highlighted Spanish Chefs and cuisine. 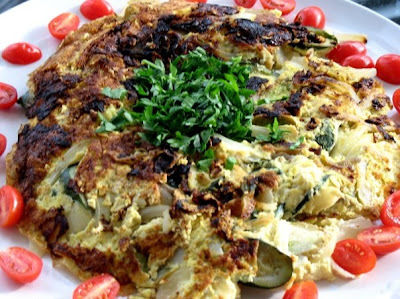 With the bounty of zucchini and squash this time of year, I used both for this vegetable omelette of sorts and it's a dish that can be served at room temperature! Zarangollo, a simple dish, which combines the ubiquitous zucchini of Murcia with onions, is a favorite of Murcian cooks, who prepare it both with and without eggs. When zucchini flowers, which are less commonly at hand and expensive, are in the market, they are usually stuffed and fried. n a large saute pan, heat 1/4 cup of the olive oil over medium heat. Add the garlic and onions and cook, stirring often, for 5 minutes. Decrease the heat to medium-low and cook for about 15 minutes, or until soft and translucent. Add the zucchini and cook, stirring often, for 15 minutes, or until they have softened and released their juices. Remove from the heat and drain off any liquid released during cooking. Transfer the zucchini to the pan with the onions. Season the mixture with salt and pepper, add the oregano, and cook over medium heat, stirring often, for 5 minutes to blend the flavors. Break the eggs into a bowl and whisk. Pour the eggs onto the vegetables and cook over medium heat for about 5 minutes, or until the eggs set. Remove from the heat and serve hot or at room temperature. Garnish with grape tomatoes and parsley before serving.